Following attack near Ofra, US Ambassador to the UN calls for the PA to stop its payments to terrorists. 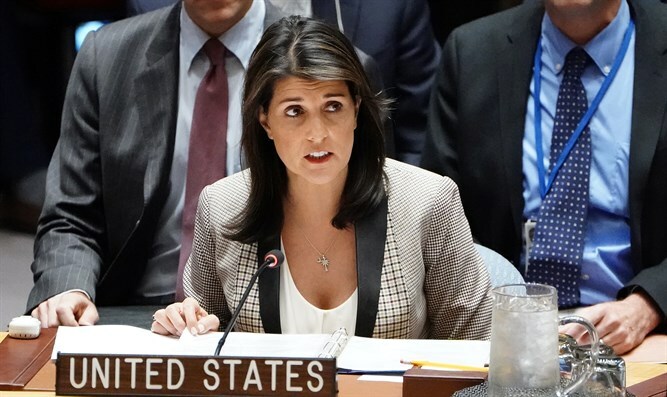 Nikki Haley, the US Ambassador to the UN, on Sunday night called for the Palestinian Authority (PA) to stop its payments to terrorists, following the shooting attack at the Ofra junction in Binyamin. “These payments need to stop,” wrote Haley. Despite repeated calls from both Israel and the United States to stop the practice of paying terrorists, PA chairman Mahmoud Abbas has continuously stressed that “families of the martyrs will continue to receive their allowances in full." In a recent speech, Abbas called the PA's continued payments to terrorists a "red line" that would not be halted under any circumstances. "The salaries of the shaheeds (martyrs) are our red line. We absorb a lot of pressure, but we will not compromise or give up on this matter, the money will go to them - until the last expulsion," Abbas said during a speech at the Executive Committee of the PLO in October.